- What many people don't know is that the meat industry is the second biggest cause of global warming, causing 18% of the world's greenhouse gas emissions, thereby exceeding the summed effect of all modes of transport. The methane emissions are also worse for global warming than the CO2 emissions from power generation or transport, because they give pure warmth, while the particulate emissions from energy generation/transport actually have a cooling effect, offsetting the warming effect of the CO2 emmitted. - 80% of the destruction of tropical rainforests has been logged to provide land for growing feed for the world's factory farms, thereby contributing to global warming, destruction of biodiversity, and depriving future generations of the wonders of these beautiful forests. 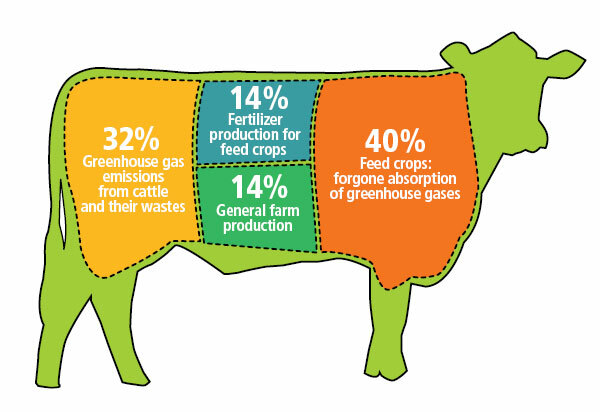 - The waste produced by factory farms is substantial. It is said that the entire area of Amsterdam could be covered by a 25cm layer of waste from the farms in the Netherlands alone. Also water pollution is often an issue through leakage of animal waste into main waterways.